In the previous article in the series, we discussed the incestuous network of civil rights organizations and their history of arrests under various governments and regimes. We discussed how there is a web of organisations that peddle the same kind of agenda that goes against the interests of the nation. We also showed how all the ‘Urban Maoists’ raised and put under house arrest belonged to one of the organisations in the entire web. This incestuous nexus that terms itself the ‘civil society’ and often one would find this ‘civil society’ coming together to condemn the hanging of terrorists like Afzal Guru or even Kasab, the arrest of Maoists, Naxals, and even be fraternising with Kashmiri separatists. The media often parrots the line of such “civil society” that is, after all, not very civil. There are times when one wonders how can sections of the media possibly be coordinated enough to publish similar articles, on the same day, taking the same line of argument. Is it because they all magically think alike? Is there a deeper connection? Remember the coordinated demonisation of the Amarnath Yatra. Articles after articles talking about how the Amarnath Yatra is not about faith alone about has a ‘political context’ to it? In the current article, we shall discuss how the Amarnath Yatra was demonized by various sections of the media based on the report of one such organization that fits perfectly well into the incestuous nexus of the very ‘civil society’ we explored in Part 1 of this series. The narrative that Amarnath Yatra is more political than spiritual was parroted by many portals. 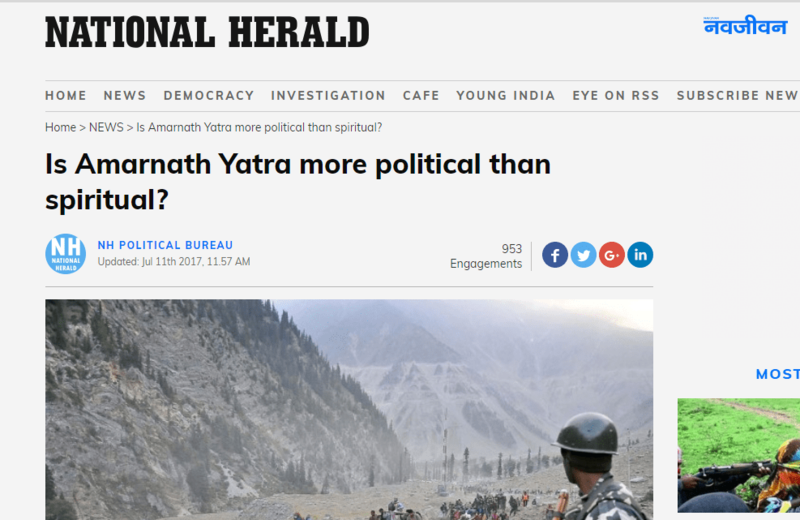 The National Herald, the mouthpiece of the Congress party, published an article titled, “Is Amarnath Yatra more political than spiritual?” based on the assertions made in the aforementioned report. The Wire, which has a complicated relationship with the truth, also published an article based on the assertions of the report titled “On the Amarnath Yatra, Faith and State Go Hand-in-Hand”. Firspost published a report on the Amarnath Yatra as well titled “Amarnath Yatra attack: Armed with faith, unfazed by tragedy, thousands of pilgrims leave for shrine” which makes use of the assertions made in the aforementioned report. Foreign Policy published an atrocious article where it states India is trying to create a ‘Jerusalem like’ situation in the ‘divided’ region of Kashmir through the Amarnath Yatra. The article quoted the members of the organizations that published the report as well. Sabrang India, which has the controversial activist Teesta Setalvad as one of its editors, also published an article in which it used the report in question to demand the demilitarization of the Amarnath Yatra and increased focus on its environmental impact. The JKCSS has three constituent organizations: Association of Parents of Disappeared Persons (APDP), Public Commission on Human Rights (PCHR) and the International People’s Tribunal on Human Rights and Justice in Indian- administered Kashmir (IPTK). Apart from the glaring fact that not just Kashmir, that even Jammu is being referred to as “Indian administered” gives one a hint about the inherent biases of the creators of the report. We shall now delve a little more into their background of the organisation that published such a motivated report on the Amarnath Yatra, which was, in turn, picked up by National Herald, The Wire, Foreign Policy, First Post, etc. 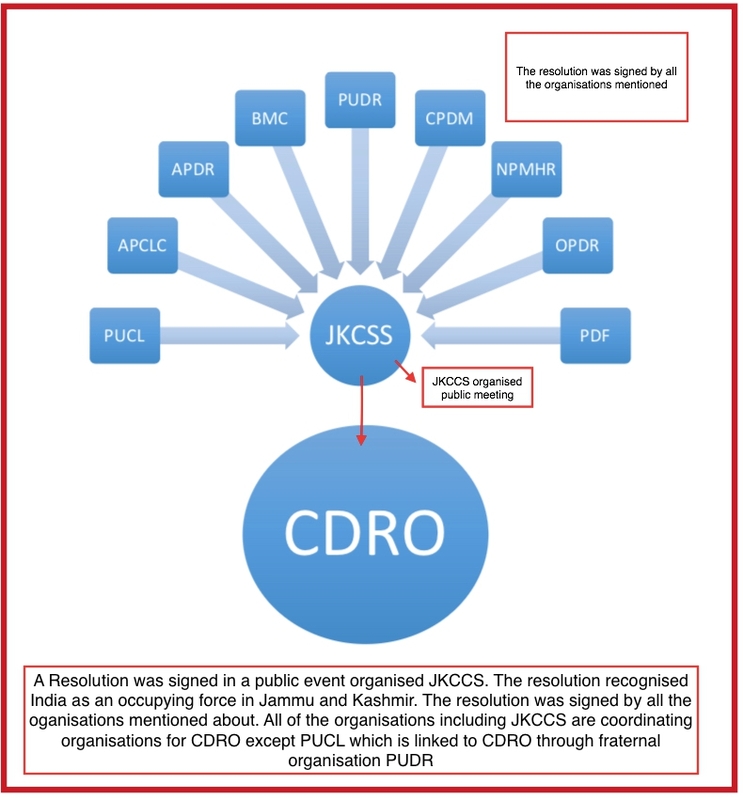 JKCCS is affiliated to Coordination of Democratic Rights Organizations (CDRO), an organization we have reported on extensively in the first part of this series, among other organizations. The CDRO has People’s Union for Democratic Rights (PUDR), Civil Liberties Commitee, Andhra Pradesh (APCLC) and Committee for Protection of Democratic Rights (CPDR) as its constituent organizations and has links with PUCL through its fraternal organization, PUDR and Committee for Release of Political Prisoners (CRPP). These organizations have a history of its members being arrested for various activities related to Naxalites as have mentioned in our report. The IPTK, which is a constituent organization of JKCSS, has Gautam Navlakha as one of its conveners. Gautam Navlakha is one of the activists who was raided by the Pune Police in connection with the violence at Bhima Koregaon and had links with an ISI funded Kashmiri Separatist. Gautam Navlakha is associated with the PUDR as well. As per ‘The Global Intelligence Files’ published by WikiLeaks, Pervez Imroz, the President of JKCCS, the founder of PCHR and one of the conveners of IPTK, said in an event organized by the federation that “the civil society had an important role to shape up the opinions in Kashmir. At a time when even lakh troopers besides cops are leaving no stone unturned to suppress the movement, it is the responsibility of the civil society to give vent to aspirations of Kashmiris”. It is also pertinent to mention that a resolution was adopted on the 20th of April, 2013 at a public meeting organized by the JKCCS which recognized “the people and territory of Jammu and Kashmir to be under occupation of the Indian State in denial of the peoples’ legitimate right of self-determination”. The resolution was signed by Andhra Pradesh Civil Liberties Committee (APCLC), Andhra Pradesh; Association for Protection of Democratic Rights (APDR), West Bengal; Bandi Mukti Committee (BMC), West Bengal; Naga Peoples Movement for Human Rights (NPMHR), Nagaland; Organization for Protection of Democratic Rights (OPDR), Andhra Pradesh; Jammu Kashmir Coalition of Civil Society (JKCCS), Jammu and Kashmir; Peoples Democratic Forum (PDF), Karnataka; Peoples Union For Civil Liberties (PUCL), Jharkhand; Peoples Union For Democratic Rights (PUDR), Delhi; Campaign for Peace and Democracy, Manipur (CPDM), Delhi. All of these organizations are coordinating organization of CDRO except PUCL which is linked to CDRO through its fraternal organization PUDR. In September 2016, Khurram Parvez, Program Coordinator of JKCCS, was put in preventive detention by Jammu & Kashmir Police. 52 academics, activists, lawyers and writers issued an open letter for the immediate release of Parvez including Arundhati Roy and Gautam Navlakha. Parvez Imroz had once claimed in a press conference that the Indian government was conspiring to kill him. As per a report by KashmirWalla, Imroz was arrested by the Police as well and a case under FIR No. 353/2013 has been lodged against Imroz at the Shergari Police Station, Srinagar. JKCSS also claimed that its researcher and lawyer, Kartik Muruktula, was detained and interrogated by the Police at the Wagah Border upon his return from Pakistan. Significantly, a connection also emerges between separatists in Kashmir and the so-called ‘Urban Maoists’. 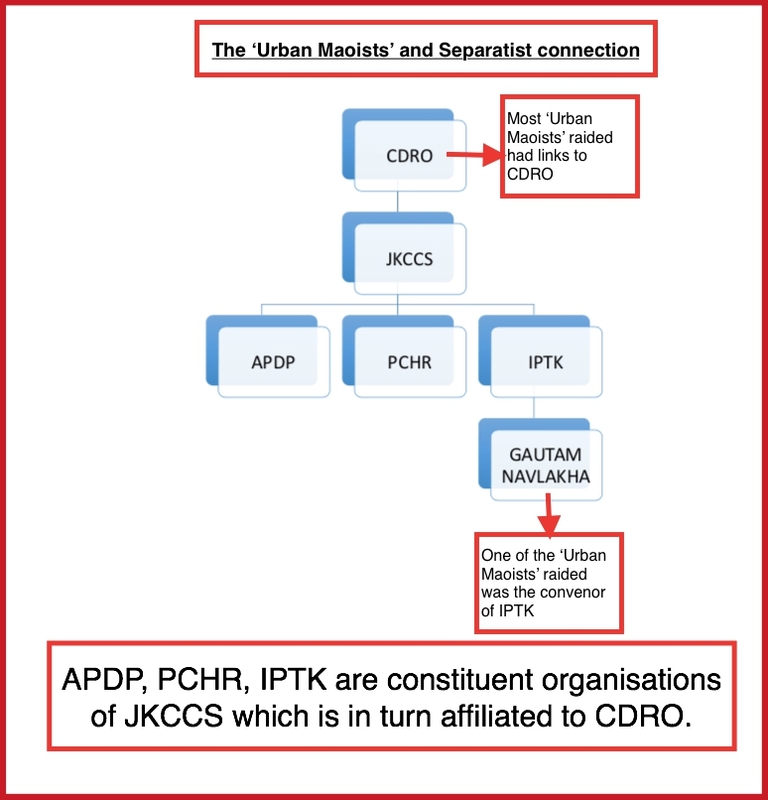 The JKCCS which calls India an occupying force in Jammu and Kashmir is affiliated to the CDRO which is intricately linked to many who were arrested for alleged links to Maoists. And a resolution was adopted by various organizations associated with the CDRO along with JKCSS at an event which was organized by the latter. 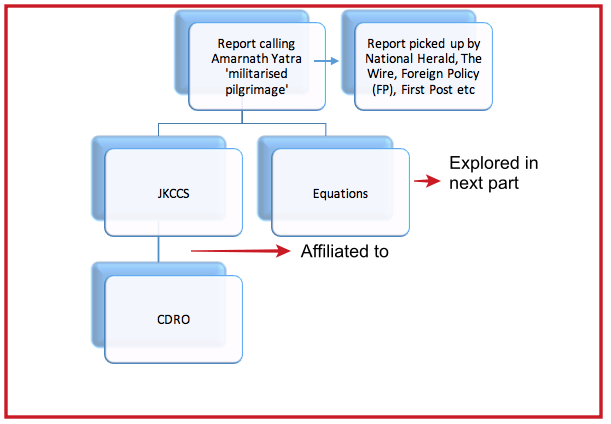 Considering the ideological inclinations of the publishers of the report on Amarnath Yatra, it is intriguing that none of the media outlets cared to inform their readers of the JKCCS’ history. Surprisingly, only The Wire attempted to offer a critique of the report and mentioned occasions when members of the JKCCS found themselves in trouble with the law. The organization that published the report has as its President, a man who believes Pakistan is a better option for Kashmir than India. That itself should have raised a red flag. It is even more bewildering that the mouthpiece of the main opposition party in India published an article endorsing the assertions made by the report which was published by an organization with clear separatist ideological inclinations. The report didn’t just come from the organisation that had separatist links and links with an organisation that featured the ‘urban Maoists’ raided recently, but also an organisation that gets foreign funding from Christian organizations. That part of the investigation will be dealt with in the next part of the series. The first part of the series can be read here.